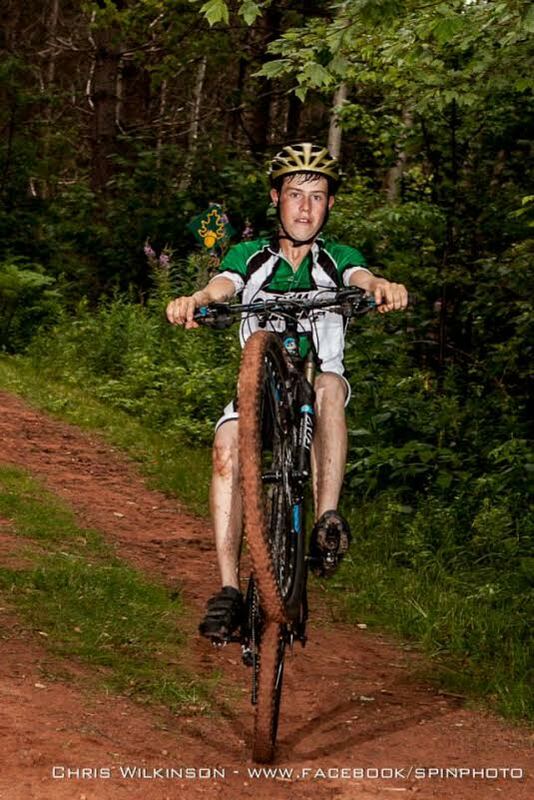 I am 18 years old and I am completing my first year at the University of Prince Edward Island. I’m hoping to get a degree in the Bachelor of Science with a focus on Life Sciences Biology. Besides my interest in human biology, I’m also very interested in sociology and psychology- the study of cultures and the study of behavior. I’m hoping that I will eventually be able to have a career involving all three of these interests! I would say that my interest in different cultures has been largely influenced by my family. Many of my family members have travelled all over the world for their careers including places like Russia, Thailand, or Japan. Some of my family has also travelled to other countries on volunteer trips similar to this one. For example, my dad Adrian made a trip in 1988 to help build huts and irrigation systems for communities in Panama. Being surrounded by all these people has really inspired me to experience as much as I possibly can. That is why I’m so glad to be travelling to Kenya with the Youth Trip in 2015! My family is great at supporting me in everything I do. Besides my dad, Adrian, there is also my mom, Maria, my two brothers, Nathan and Ryan, and our golden retriever Sam. I am so thankful to my family for the opportunity to experience something so completely different from my normal life and I look forward to gaining these new perspectives. I am 17 years old and I am currently in grade 12 at Charlottetown Rural high school. In the following years I plan to study sciences at Mount Allison University in Sackville New Brunswick I want to pursue something in the health and medical field but that could change. I have volunteered many times for various things within my community from coaching skating lessons to teaching Sunday school and I am very excited to help volunteer in Kenya this coming summer. I’m not an experienced traveller but I have aspirations to become one and even have hopes to study abroad during my university years. I have been involved in many different extracurricular activities over the years. Some of my favourites are figure skating which I have done since I was five, soccer, and 4-H. My family which consists of my dad Fred, my mom Karen, my older brother Kyle and my little sister Megan have all been very supportive of everything I’ve chosen to do and have endured many hours at cold rinks for me. I am honoured to have been chosen to participate on the Farmers Helping Farmers youth volunteer trip to Kenya. I look forward to helping out and bringing back lots of new perspectives. I am 17 years old and am currently in grade 12 at Bluefield High School. I am very involved in my school and am a member of SADD, Step-Up, the Outdoor Adventure Club, and student council. My favourite sports are field hockey and rugby. This year I was honored to be chosen as co-captain of my school’s field hockey team and am looking forward to playing rugby in the spring. I also love skiing and am a ski instructor at Brookvale. I try to be an avid member of my community and church by volunteering as a Sunday school teacher, acting in the South Shore United Church Dinner Theatres, and volunteering at church suppers. Next year I plan on studying sciences with the goal of obtaining a Science degree and majoring in either biology or chemistry. As of now, I have yet to choose which university I will be attending but am hoping to stay in the Maritimes. I have always aspired to be a doctor so med school will hopefully be in my future! I am so thankful for all of the love and support my family gives me. I am very lucky to have my mom, Tammy, my dad, Mark, my older brother Alec, and my younger brother Andrew. Together we live on a beef and potato farm in North Tryon. In grade 8 I fell in love with travelling when I went to Ecuador with Cara DeCoste and my mom on a voluntour. Since then I have travelled to the Dominican Republic, Cuba, British Columbia, Alberta, Ontario, Quebec, Vermont, New Hampshire, and Maine. One of my long term goals is travelling to developing countries and providing free medical care. I am extremely grateful to my mom, one of the organizers of this trip, for all of the travel opportunities she has given me through her own involvement on volunteer based trips. I am beyond excited to be going on the trip and cannot wait to take part in this amazing opportunity. My name is John Ployer. I am 16 years old and I am from Martinvale, Prince Edward Island. I am going on the 2015 Youth trip to Kenya. I live in Martinvale with my mother, Shelley, whom I am very thankful for her support. We live with my pet rabbits as well. 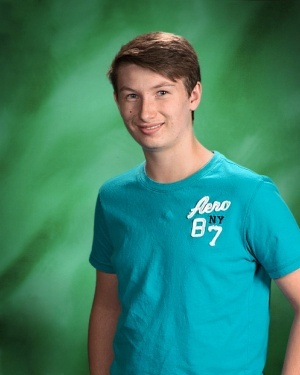 I am in grade 11 at Montague Regional High School, my favourite subject is biology. I’ve previously attended Cardigan Consolidated and Montague Intermediate School. I enjoy school and I am involved in many school groups like student Council. 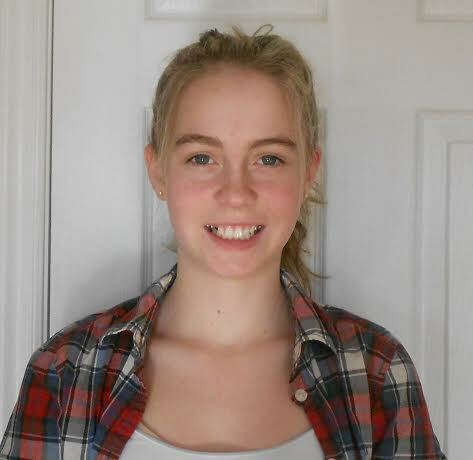 I am an active member and club president in the Grand River East 4-h club taking rabbit and beekeeping projects. I also volunteer at the Dundas Plowing Match and St. Andrews Presbyterian Church, Cardigan. I am very excited to be going on 2015 Youth trip to Kenya. I enjoy travelling and am very thankful for this amazing opportunity. I want to go on this trip because I’ve always wanted to visit other places and experience other cultures, and hopefully to help out others and share. I am 16 years old and I am completing grade eleven late French immersion program at Kensington Intermediate Senior High School (K.I.S.H). After I finish high school I am hoping to graduate and become a small animal veterinarian. My favourite courses in school are Biology, Physics, and Math. I guess this is why I wish to become a Veterinarian. The reason I joined this trip is because as a child I was always interested in travel and Africa due to my love of the Lion King movie. I wanted to learn all about the culture and life in Africa. As I got older and was more involved in my church with our twin school Kamuketha Primary I saw the support and progress Farmers Helping Farmers had made with the school and community. This was when I decided I wanted to go with Farmers Helping Farmers to help in a community in Kenya. When I read about this trip in the bulletin I knew I had to go be a part and help Farmers Helping Farmers with this mission Kenya 2015 trip. Besides my love to travel the world I am also enjoy playing many sports including Volleyball, Basketball, Dodge ball, Rugby, Track and Field, and badminton. When I’m not playing sports I enjoy reading, drawing, and being outside going for walks with friends. My greatest supporter of this trip is my family. My parents Calvin and Tracy are both excited and nervous for me. While my two sisters Emma and Hillary are both supportive and happy for me. I am so happy for the support of my family and friends support for this trip. I am also thankful for Farmers Helping Farmers for giving me this opportunity to travel to Kenya with them to help out in this community and to have this great new experience. I have always loved geography, which includes looking at maps, flags, and pictures of places all over the world. My Mom has always loved to travel as well. She has been to Kenya with Farmers Helping Farmers and has lived in Ghana. When this opportunity came up I wanted to go to share her experiences. I would consider myself an experienced traveller. I have visited Denmark, Estonia, Russia, Finland, Sweden, and Germany on a Balkan Sea cruise. I have also been on a cruise to the Caribbean, visited Cuba, and this March our family is going to Honduras for a vacation. I love to play sports, especially hockey and soccer. I have played soccer for as long as I can remember, playing with multiple teams and also getting to represent PEI at the Atlantic All-Star Tournament and also at the Canadian Nationals in 2013 and 2014, getting to visit B.C. on both trips. I hope to continue playing soccer at the varsity level in the near future. In addition to soccer, I am also very passionate about hockey. I have been playing hockey since I was five years old. At school I take part in track and field, participating in the 400m dash and triple jump. In addition to sports, I still find time to show my dogs at 4-H shows across PEI. This year in 4-H, I am very honoured to be selected to go to Ottawa this April to participate in the Citizenship Seminar. My family has been very supportive of me in my sports, 4-H, and travel. My family includes my Dad, Jamie, my Mom, Janice, my younger brother, Trevor, and my two dogs, Rocky and Diamond. Our family lives on a busy farm. At our place, we stable Standardbred racehorses and on the original family farm we have beef cattle, hogs, and cash crops.I am so grateful to have the opportunity to go to Kenya where I can bring back a new understanding and prospective of the world so that I can share it at home with family and friends. Hi – My name is Tristan Russell MacLean. I have grown up on P.E.I. but I’m also connected to other parts of Canada because my mom is from Winnipeg. I’ve also spent a lot of time at my grandparents’ cottage on the Ottawa River at a place called Fort William. I grew up in Stratford P.E.I., going to Glen Stewart and Stratford Elementary Schools. Then I went to Stonepark Intermediate and now I’m at Charlottetown Rural High School. I like sports. 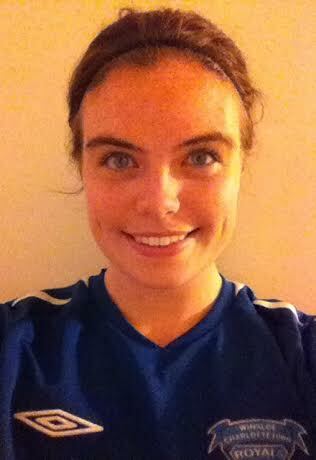 I’m a keeper in soccer and have travelled to Nova Scotia, New Brunswick, and Newfoundland for competitions, including the 2014 Canadian championships. I also enjoy hockey. I have played for the Pownal Red Devils since I was five years old. For pets, we have an Australian Shepherd Mini named Kai, age 2, and a grey cat, Penny, age 3. They keep us very busy! For the last year, my mom and I have done a lot of fundraising to build 3 classrooms at Kamuketha Primary School in honour of my brother Callum. It will be great to see the classrooms in person. I want to thank everyone who has contributed to our fundraisers over the last year. I am 17 years old and completing my final year at Bluefield High School. Throughout my three years at Bluefield, I have been dedicated to many extracurricular activities. This year I am pleased to be the Yearbook Editor, a Student Council Executive member, and a participant of the Duke of Edinburgh program, SADD, and the Outdoor Adventure Club. I also played soccer and I am currently a co-captain for the basketball team. In addition to my involvement at school, I love to help in my community. I teach Catechism every Sunday and am a Liturgical Reader at my church. 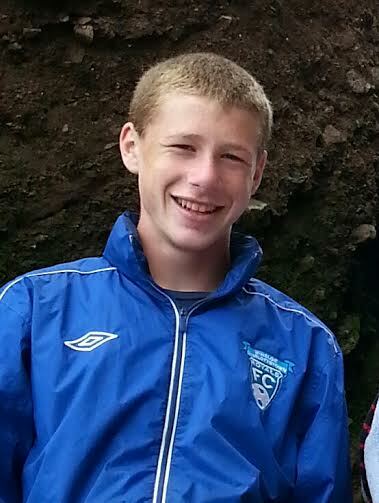 I have played Provincial and S1A soccer, and in the summer I enjoy coaching youth soccer. Although I have yet to choose the university I wish to study at next year, I plan to stay close to home. Presently, my interests are in Business and Law, and hopefully I will become strongly involved in university activities. 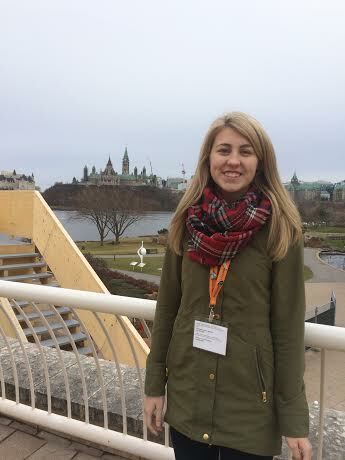 In grade 11, I had the opportunity to attend the National Student Commonwealth Forum in Ottawa. The program’s theme for the week was Food Security around the world. Due to many activities and presentations about this topic, my eyes were open to the specifics of food insecurity in different developing countries. Through this, I became greatly passionate about making a difference and Farmers Helping Farmers is providing me a chance to do so. Furthermore, my family has a strong agriculture background and farming plays an important role in our lives. I am a very lucky girl to have three wonderful older sisters to look up to and two loving parents as role models. My family has always supported me and I am grateful that they encourage this trip. I cannot wait to travel to Kenya and I would like to thank Farmers Helping Farmers for this amazing opportunity and for being an outstanding organization. 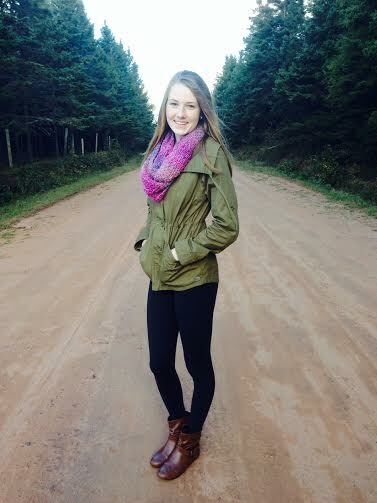 My name is Sadie Milner and I’m a 17 year old student at Charlottetown Rural High School. I’m in my final year of high school and plan to continue my studies here on the island as a student in the Science program at UPEI, majoring in Chemistry. Interest wise, I love many things. I love biking, playing sports and just hanging out at home . I’m really looking forward to biking, looking at new, foreign books and eating lots of different foods on our trip. I am thankful for my family; my 4 sisters and cat. I’m very thankful for my best friend Abbey and my parents who support me on all of my decisions and help me along the way. When I’m not at school, You could find me working at my job. Or be volunteering at the QEH. Or at home just hanging out with my family or friends. I’m so thankful to be given this amazing opportunity to relive some old memories but more importantly make some new ones. My name is Taylor Larsen. I am 20 years old and soon graduating from Holland College from the Construction Technology and Management program. I am an outdoors person. I work with a property maintenance company where I operate heavy equipment and do snow removal. I live on a family farm where we raise beef cattle and field crops. I am very excited to travel to Kenya this summer with Farmers Helping Farmers. Asante.